The spate of mass shootings in this country are enough to make people question the existence of a benevolent and omnipotent God. The issue of how to reconcile the existence of loving God with the evident evil that exists in the world has been an issue for philosophers and theologians since the Age of Rationalism began. Gottfried Leibniz created a framework to reconcile these seemingly opposed aspects of the universe, while preserving the theological foundations of a Deity of Good. He called his creation a theodicy, and it was one of the first attempts to justify the existence of God using rational thought, while also creating a framework to explain the evil in the world. It is different from a simple defense, which does not attempt to explain the existence of evil or even help people understand why evil exists. There are four aspects of a theodicy. First, it must provide justification of the existence of God despite the evil in the world. Second, it must be built from a common sense world view, which means that it cannot draw on obscure points of theology, but must work from common belief. Third, it must draw from historical and scientific opinion, which binds it into the realm of logical argument. Finally, the theodicy must be built off of plausible moral principles. It was one of the first attempts to bring God into the realms of Natural Philosophy. As this is an interesting theological exercise, in light of the events in Newtown, I would like to build a Theodicy to try to explain the horrors inflicted by armed villains. I am doing this in response to the disgusting statements of people like Mike Huckabee, who claim that these mass shootings occur because we have "excluded God from the public schools." Before I build my argument, I must address these statements, because not only are they vile in light of a tragedy that has left twenty small children dead, but also because if that is true, then God is irredeemably evil, and there is little if any difference between him and Satan. In the Book of Job, God allows Satan to inflict disaster and suffering on Job, to prove that no matter what happens, Job's faith is strong enough that he will not turn away from God nor will he curse God for what has happened to him. After Job's faith is affirmed, and Satan is proven wrong in his belief that Job only loves God because God has gifted him, Job receives back what he has lost. While the story of Job is disturbing on a number of levels, in the end God is shown to be just and compassionate. That is not the case if God massacres children to prove a point. Unlike in the story of Job, those children will not come back, nor will they be replaced, as were Job's herds. God simply obliterated them without mercy. Even worse, if God is sending these things to teach us a lesson and out of anger that we have supposedly excluded Him from our country, how evil must he be to slaughter the innocents to make a statement. The children have nothing to do with deciding issues like prayer in school gay marriage or any other social issue people want to blame. It is also quite likely the parents who are now grieving did not have anything to do with those decisions either. To punish people who have done no wrong, and let the actual decision makers remain unsanctioned is an evil beyond belief. If God is so cruel as to do these things, then God is not good or loving. Since that is so alien to what I believe about a loving deity, I must reject it and with it I must condemn anyone who uses this sort of disgusting rhetoric to try to sway a grieving nation. It is an act as evil as the initial massacre. There are things you simply do not do, and one of those is telling a grieving parent that their child died because America allow gays to marry or has taken Christian prayer out of the schools. Instead, I must look at how this sort of evil can exist in the world, despite an all powerful and all loving God. And through that exploration, I will try to build a Theodicy. I do want to state, I am not a true theologian, and I do not know if this is going to be correctly constructed, but I want to try to rationalize, for myself at least, the issue of evil in the world and how God can permit it's existence. I am also not going to fall back on the easy explanation that the evil in the world is the result of Satan. This explanation either neuters God, making him powerless to prevent the Devil from having Earthly reign, or it makes God a defacto accomplice, sanctioning the actions of Satan. This explanation is what is called a defense, and would have been the rationalization prior to the Enlightenment. As such, I would like to use a more sophisticated theology. The core of the reconciliation between evil and God lies in the concept of Free Will. I have explored this concept previously, in this blog post, but here I want to look at it from the point of view of God. God gave mankind Free Will and this means He cannot intervene, even when our actions are horrific and evil. People make the choice to commit evil acts, and for him to intervene in these instances revokes the very idea of free will. It is basically similar idea of a parent letting a child chose their path. As a parent, you can tell when a child is going to screw up their life, but in the end, forcing a child to make the right decision keeps the child forever an infant. There is no growth without the ability to screw up. But beyond that, if God intervenes and stops someone from committing evil, the entire framework of Free Will becomes an illusion, because the underpinning is knocked out. To further explain this, we have to look at the nature of Sin. To commit sin, there must be two aspects, the decision and the action. I reject the traditional Catholic view that the sin exists only in the decision, and the action is irrelevant. If you decide to commit a sin, then upon reflection have recognition of the irrevocable nature of that sin and turn back from the precipice, then you have found redemption, and have not committed a sin. Similarly, if you sin outside of a conscious decision, either because of extreme need, or being forced to, you have not actually sinned. This covers the Valjean dilemma; stealing a loaf of bread because you are starving. It also covers things like the necessity of killing in a war, possibly even if the cause you are fighting for is unjust in the eyes of God. While the first is sanctioned by most religious authorities, I know that the second is morally questionable, because it skirts the line of the Nuremberg Defense. However, most people would agree that killing in times of war is sometimes necessary, especially in a kill or be killed situation. So, outside of the situations that may look like sin on the surface, but do not actually constitute sin, people have the option to chose between Salvation and Damnation. For God to intervene and stop the actions that are required for the commission of a sin, He actually eliminates the option of Free Will. At that point, we move into the realm of Predestination, that all souls are destined for Heaven or Hell, regardless of the decisions they make in life. But why, then does He allow innocents to die. Can He not contain the evil? Unfortunately the answer has to be no. For him to directly intercede in the affairs of man breaks the rules as well. He would have to weigh the worth of all people, and choose who would live and who would die. In other words, he would have decide who's life was worthy of being spared and who was unworthy enough to allow them to be killed. This is problematic on many levels. First, it eliminates the possibility of redemption. Perhaps the person is on the wrong path now, but later recognizes the error of their ways and straightens up. I understand that the concept of omniscience means that God would know if that person would ever find salvation, and of course He could arrange to only have damned souls die in these sorts of incidents, but then that leads to an even more horrific problem. It means that everyone who dies in incidents like Newtown essentially got what they deserved. It would mean that everyone who died that day was basically a horrible person who God decided to obliterate. It also means that people would have no reason to grieve the losses, because they deserved it. That is the Fred Phelps view of the world, but beyond that fringe, this is an idea that must be rejected. So basically, God's gift of Free Will means that He understands that sometimes people will misuse that gift. That is why He gave us the gift. And further, if he were to intervene, he would either revoke Free Will, or he would make us have no sympathy for the victims, which would irrevocably harden our hearts against people who suffer tragedy. In this view, Job would have gotten what he deserved and would not be a lesson in faith overcoming adversity. There is a story about World War Two that is relevant here. The British had cracked Enigma, the primary code used by the Nazis. The secret that they had cracked the code was probably the single biggest factor in the Allied victory in Europe. After the code was cracked, the British decoded that the Luftwaffe was planning to firebomb the city of Coventry, which at the time had almost 200,000 residents. The attack that was being planned was unprecedented, and would certainly cause massive death and destruction. At this point, Winston Churchill had a choice, he could evacuate the city and build up it's defenses, saving hundreds or thousands of lives, but reveal that Enigma was broken, or he could do nothing, let the city be devastated and keep the secret that Enigma had been deciphered. In the end, he let the attack happen; 800 people died, and thousands were injured. Most of the city was left in ruins, and in the whole of the war, the only British city to take more damage was London itself. But the secret was kept. Thousands were killed or injured so millions could be saved. Had the Germans known that Enigma was broken, they would have changed the code, and quite possibly won the war. Churchill later said that the decision to not save Coventry was the single hardest decision of his life, and it haunted him for the rest of it. 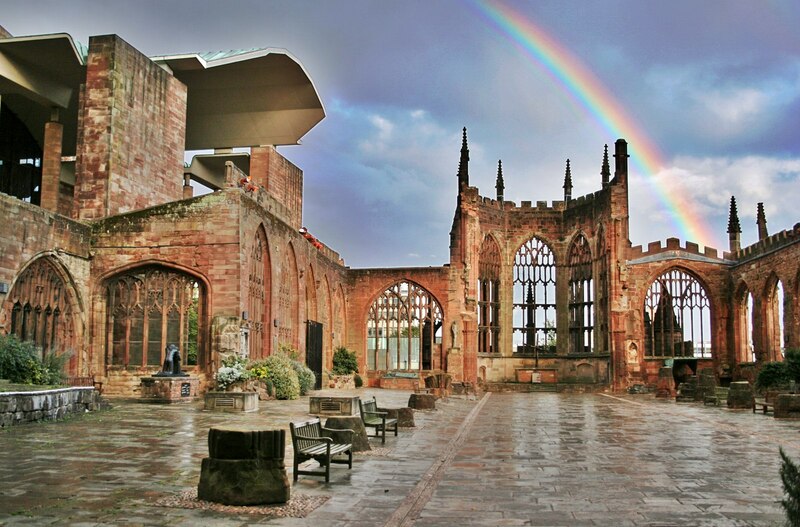 In the end, you could say that the horrors that occur in the world are God's Coventry. As always, well said and good points.